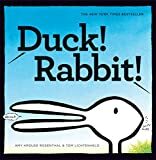 This book for young children is a short dialogue between two people on whether they are seeing a duck or a rabbit. The person on the left sees a duck, the one on the right a rabbit. They give reasons to show that the other person is wrong, but they do not manage to convince the other. Then the duck/rabbit disappears, and the start thinking that maybe the other person was right. So it is a funny and clever take on the idea that different people have equally legitimate points of view on the same subject, and that it can be helpful to try to see things from other people's viewpoints. The artwork is simple and pleasing.